We have just released version 1.1.0 of The Levelator™. This is the audio tool podcasters have been raving about. Not only does it have a new look, it is also substantially improved over its beta release. We have also adjusted the license so that it can be used free for both commercial and non-commercial use. Downloads (Windows and Mac) and additional info is available here. Much nicer installation and app performance. It would be nice if the app would preserve the ID3 tags after conversion. Thanks Kevin. The ID3 tags question is interesting. 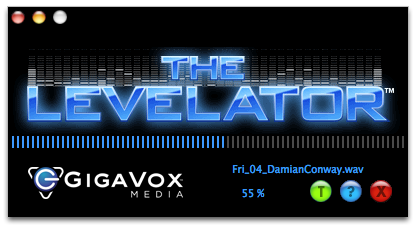 Since The Levelator is designed to work on uncompressed audio the assumption is that it would be used prior to anyone completing ID3 tags. Ideas and suggestions like this are discussed in the Forums. I’d share the idea there. Thanks! Wanted to publicly say thank you for both versions of Levelator! We wrapped our pro football player podcasts today and with the miracle that is the Levelator I was able to regain 2 hours a week of my life for the last 16 weeks. Levelator is the best secret weapon for podcasters working with less than idyllic source recordings, especially from phone calls.